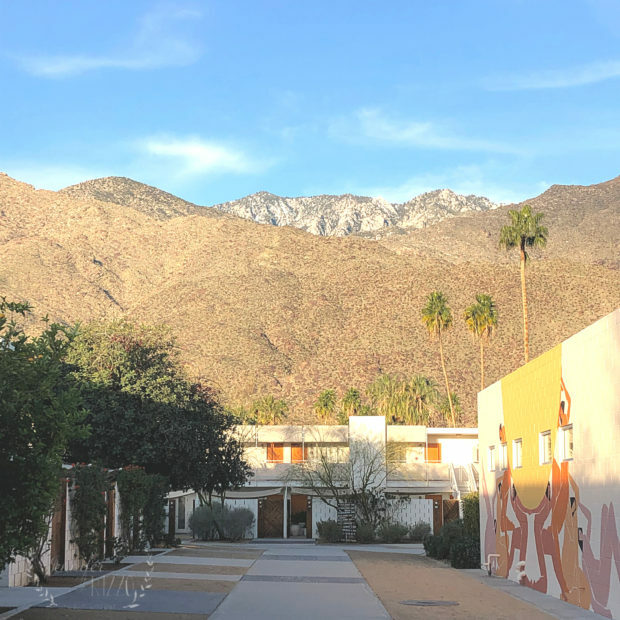 We stayed at The Ace Hotel Palm Springs for the Creatively Made Business workshop. I wanted to share it with you because it was a really fun place to stay, and definitely very Instagrammable! I was a little surprised when I first landed in Palm Springs, and almost the entire airport was outside! I have to admit, it was out of my norm, and I felt like I had almost never traveled before. 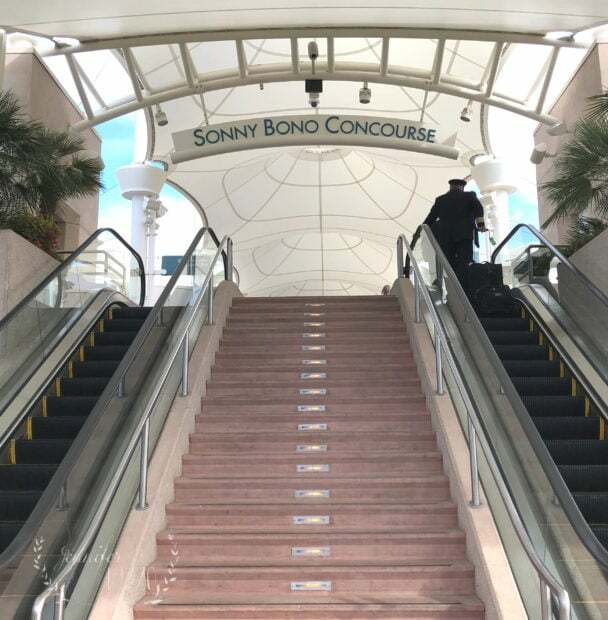 It felt very resort-y from the moment I got there, and I loved the fact that Sonny Bono has his own concourse named after him. 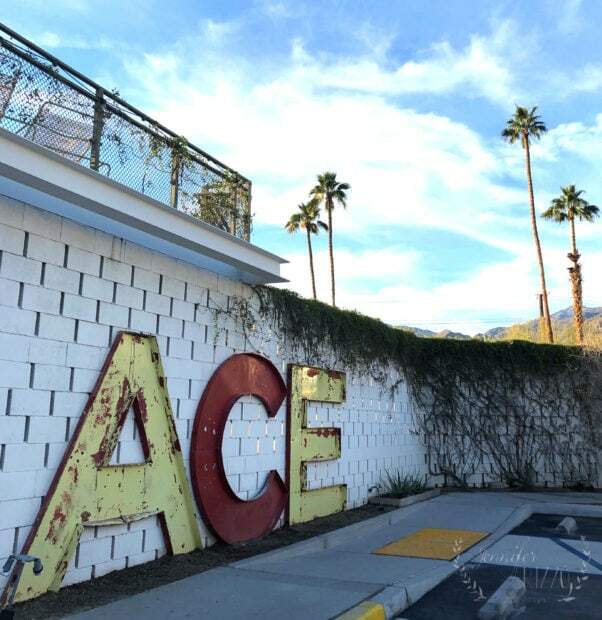 The Ace Hotel Palm Springs had a very cool vibe the moment I got there. It was one of those, so retro it’s cool again places. They had a lot of great, “modern” design choices that added to the vintage quality, with out it feeling too old. 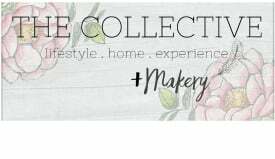 If I had to call it a style, I would say it was retro-eclectic-mid-century-modern-boho-chic. The front lobby had a fun, eclectic, boho, MCM feel. 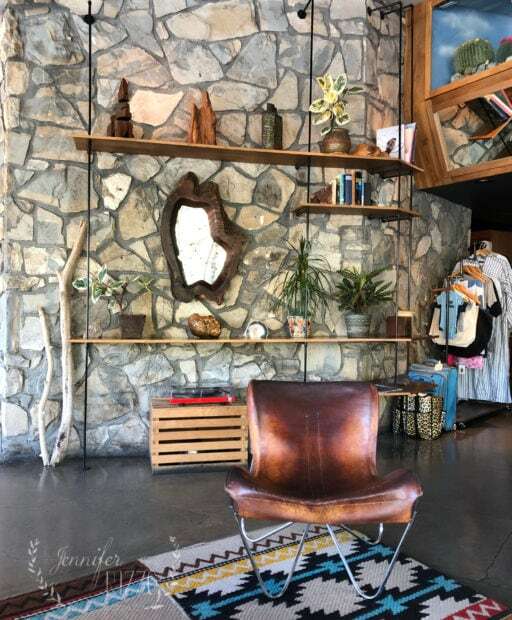 I loved the rock wall with the open shelving, and I wanted to take that chair home. 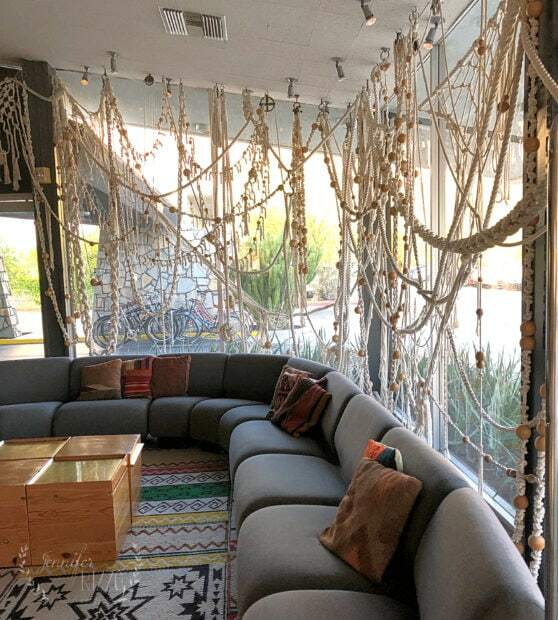 On the other side of the lobby, there was a giant sectional couch, and a window full of really awesome macrame. I kind of felt like these were my people. 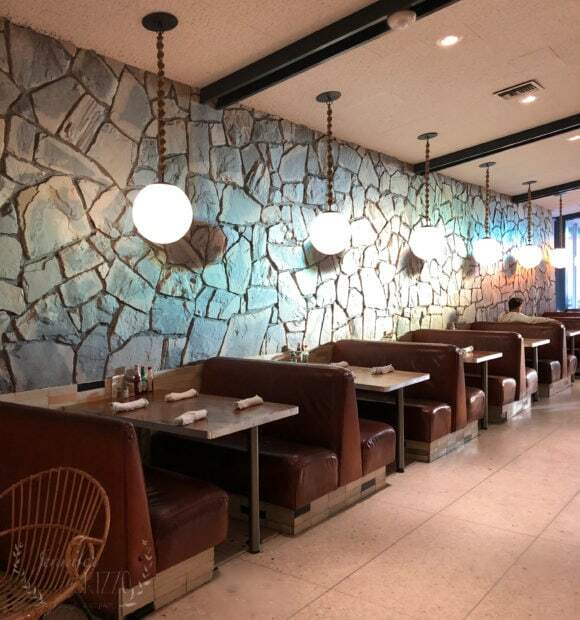 The restaurant , King’s Highway, had that old, 1970’s thing going on. It was a great gathering place, and I ate there quite a bit. They had an amazing beet salad, and french toast with coffee jam. Even walking to my room, there was an awesome mural by artist Laura Berger on one of the walls. I loved being somewhere that we were surrounded by art. The rooms had a bohemian feel, with low beds, and canvas tarps for curtains. We were hardly in them, and they were the perfect place to drop your stuff, and enjoy the outside. As a part of the workshop, we took a Mid-Century Modern architectural tour. We saw a lot of amazing homes, and heard some really cool background about Palm Springs. 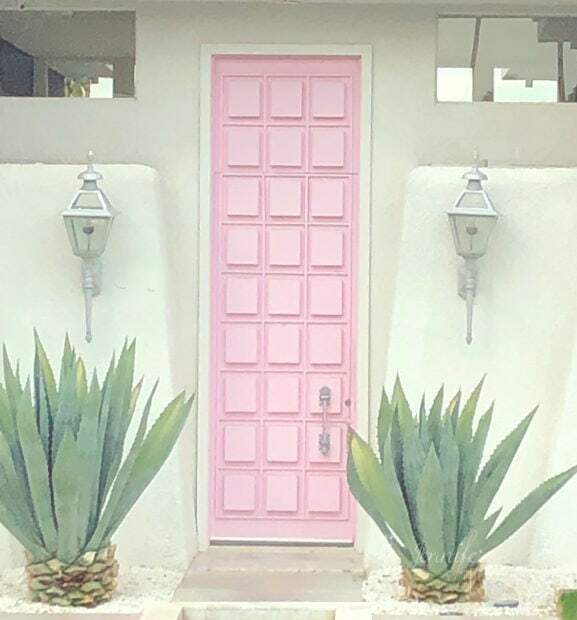 We even saw the “famous” pink Instagram door. The other thing that blew my mind, is how much food was just…growing. There were tons of citrus trees of all varieties, olive trees, and pomegranate trees. As someone who struggles to keep my tiny Meyer Lemon tree alive inside, and where things only grow about 5 months out of the year (if we are lucky), this was astounding for me to see around every corner, and how it flourished in the middle of a desert. My one regret is that I never tried a date shake. It sounded really good, and time just ran out. I’ll just have to grab the family and go back to The Ace Hotel Palm Springs. I think they would love the experience of something so different from what we are used to.